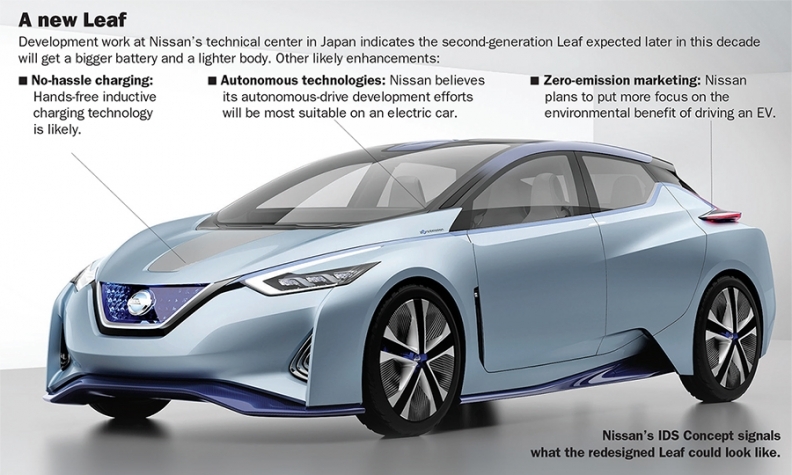 ATSUGI, Japan -- Nissan Motor Co. is barreling ahead with development of a next-generation zero-emission car for the mass market -- despite its Leaf electric vehicle's low sales volume. Based on glimpses of work being done here at Nissan's technical center, the next Leaf could carry far more battery power, allowing for a full-charge driving range of close to 300 miles, instead of its current EPA-rated range of 107 miles. The envisioned car will be lighter, using carbon fiber. It will permit hands-free recharging, allowing owners to park over an inductive system floor mat that does the charging automatically. And although autonomous driving faces a gantlet of government regulation and approvals, the future Leaf is being readied to lead Nissan's plunge into mass-market use of that technology. The company's reasoning is that the new age of electronic safety controls needed for autonomous driving works hand-in-hand with the electric power systems of EVs. Prototype vehicles with Nissan's most advanced autonomous-drive technologies prowl the public streets of Japan, and one will soon begin testing on U.S. streets. The prototypes are all Leafs. The determination behind the project contrasts with Nissan's meager rewards to date for pioneering in mass-market EVs. The Leaf went on sale in the U.S. in December 2010 and was perennially the U.S. EV segment sales leader. But consumer appetite for the car has declined. Dogged by the return of cheap gasoline and rebounding demand for brawny pickups and crossovers, Nissan's U.S. dealers sold just 14,868 Leafs this year through October -- a decline of 39 percent from a year earlier. The car is subsidized by a $7,500 federal tax credit designed to encourage EVs, as well as various state and local purchase incentives. Nissan has invested $5 billion in its global EV campaign, including $1.6 billion to build a battery manufacturing plant in Tennessee. But Nissan CEO Carlos Ghosn remains one of the industry's biggest advocates for EVs. He says an industry shift to electrification is inevitable. The only caveat, he says, is how fast that shift will occur. Nissan CEO Carlos Ghosn says an industry shift to electrification is inevitable. "I don't think anybody envisions today a future without the electrification of cars," Ghosn told Automotive News in October during the Tokyo Motor Show, commenting on Nissan's work on a better battery. "Zero-emission cars will grow because restrictions on emissions are going to get tougher and tougher. So we have to continue our kaizen -- our continuous improvement -- on the present technology and improve our technology." Officially, Nissan has barely acknowledged that there will be a second-generation Leaf, let alone revealed specifics about the product, which likely will appear in the 2018-20 time frame. But engineers in Atsugi freely show the work they are doing on a future EV that fits into the Leaf's footprint. The team is in the late stages of a perfecting a 60 kilowatt-hour lithium ion vehicle battery that has the same dimensions as the 30 kWh battery just introduced on the 2016 Leaf. The 30 kWh battery is an enhancement from last year's 24 kWh battery. The 60 kWh battery has graduated from r&d last year to running in prototypes today. Teams also have targeted aerodynamics in a big way for the next EV. Engineers at Atsugi note that even a small improvement in aerodynamic design goes a long way on a battery-powered vehicle. Power escapes from all vehicles in different ways. Internal combustion engines lose energy in the form of heat. Friction in wheels, axles and transmissions sap the efficiency of a car's powertrain. The Leaf has no engine, radiator, fuel pump or exhaust system. So reducing friction in its wheels, and improving airflow around its wheelhouse and windshield promises proportionately bigger efficiency gains than the same work on a gasoline-powered vehicle. The enhancements also have targeted the chemical resistance involved in recharging the battery. Without giving specifics, Nissan's engineers promise the new battery will allow faster charging. The 2016 Leaf requires about 6 hours to fully charge using a 240-volt home electrical current. In discussing the Leaf's future, Ghosn also hints at a shift in marketing strategy. He acknowledges that U.S. consumers have focused mainly on the economics of owning a battery-powered car. Their equation is how much of the monthly household budget can be saved by not filling up a gasoline tank -- a math equation that loses its excitement when gasoline drops to $1.95 a gallon, as it is in some areas today. 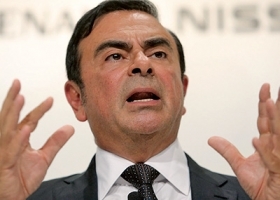 Ghosn says that the marketing focus instead should be environmental. "Thinking that you're going to sell electric cars for economic reasons is somewhat of an illusion," he says. "You're going to sell them more on emissions and incentives. "Many cities are now stunted because of air quality," he adds, citing Europe in particular. "There will be certain places where if you don't have a zero-emission car, you can't go into certain parts of the country. "The price of gasoline is going to be either head wind or tail wind for us. It will slow you down or accelerate you," he says. "But it's not going to change the direction of where we're going."